In the above video I show how simple it is to make a traditional tongue and groove wood joint in just a couple minutes. 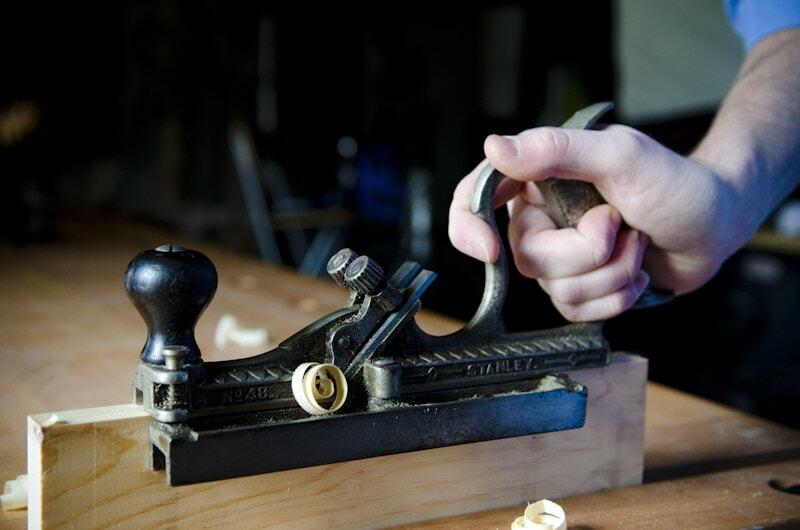 A dedicated tongue & groove plane, like the Stanley No. 48 Tongue & Groove Plane, saves a lot of time and frustration. I love my Stanley No. 48, especially because the fence flips when you’re finished with cutting the groove and allows you to seamlessly cut the tongues! I’ve also used the Stanley No. 148 “Come & Go” Tongue & Groove Plane, but didn’t like it quite as much as the Stanley No. 48. Good think too, because they’re rarer & a bit more expensive. You can also checkout the antique Stanley No. 49 planes if you’re planning on using 1/2″ thick boards. The Lie-Nielsen Tongue & Groove Planes are based off the Stanley No. 48 and No. 49 planes. But the Lie-Nielsen planes are $195 each and a vintage Stanley No. 48 or 49 plane will sell for around $20-$100. Besides, it’s super easy to restore a Stanley No. 48 or 49.